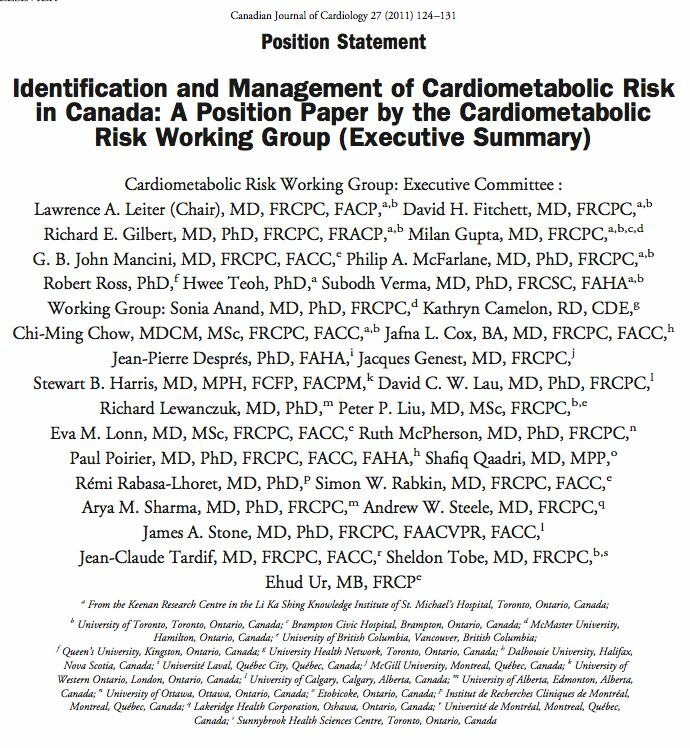 The latest issue of the Canadian Journal of Cardiology, published by the Canadian Cardiovascular Society (CCS), both of which are largely funded by the drug industry has shamelessly published a “Position Statement by the Cardiometabolic Risk Working Group” (see highlights below). We have previously blogged about the American “Expert Panel on Detection, Evaluation and Treatment of High Blood Cholesterol in Adults” and the Canadian “Working Group on Hypercholesterolemia and Other Dyslipidemias”. Now that the ability of “cholesterol” to induce terror in doctors and patients has become a little worn and less profitable, drug dealers have invented a new disease, “cardiometabolic risk” with which to terrorize asymptomatic people into demanding even more drugs and doctors into prescribing them. Many of the members of the previous covens have migrated to the new one. These medical covens take it upon themselves to dictate to the rest of the medical profession what drugs should be prescribed to prevent diseases of lifestyle in the otherwise “normal” population, so-called primary prevention. How are these covens assembled and what gives them the authority to establish norms for other doctors? This paper reveals in stunning clarity the answers to these questions. 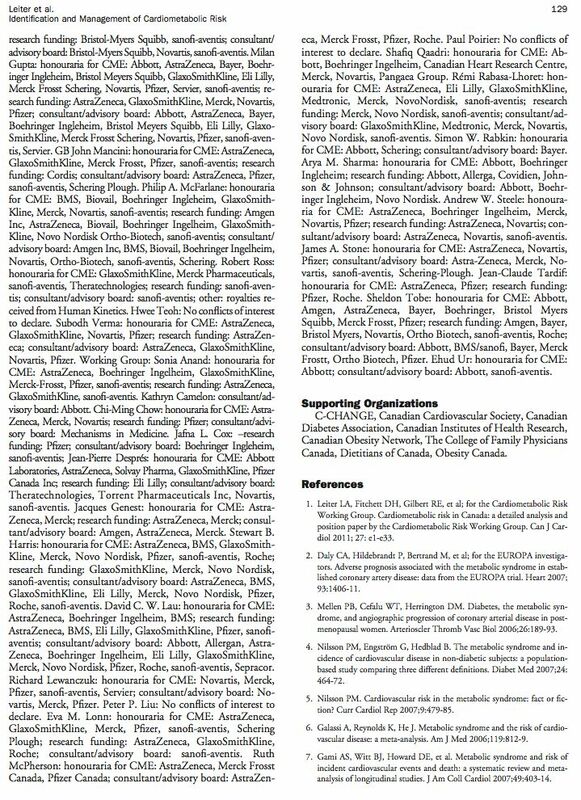 As we can see from the Acknowledgements and Disclosures sections, most of the authors of this Position Statement have many long-term financial relations with many drug dealers. Of the ten members of the executive committee of the Cardiometabolic Risk Working Group, nine have multiple financial relations with drug dealers and of the whole Working Group 19 out of 21 have similar relations. Clearly, drug dealers have distributed tens, if not hundreds, of millions of dollars to these doctors, justified under various guises, to facilitate a culture of drug dependency. 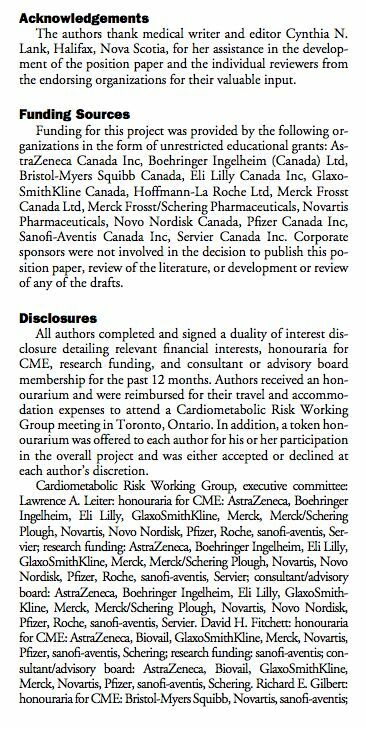 Drug dealers choose members of the Working Group, pay them to be “authors”, pay a medical writer to compose the Position Statement and get it published in a journal which would not exist without the financial support of the same drug dealers. Why am I not impressed and why would any other doctor follow the advice of this coven? But most family physicians and many cardiologists treat this sort of statement, endorsed by presumably unassailable organizations like the CCS, as revealed truth by a mysterious higher authority in possession of occult knowledge that must be accepted or suffer ostracism by one’s colleagues. Of course it doesn’t hurt that a 30-second drug prescription for numerical symptoms of junk food addiction is much easier that spending many unpaid hours reducing the addiction, the only real way to prevent its consequences. Here is an example of the occult numerological incantations of the Working Group. 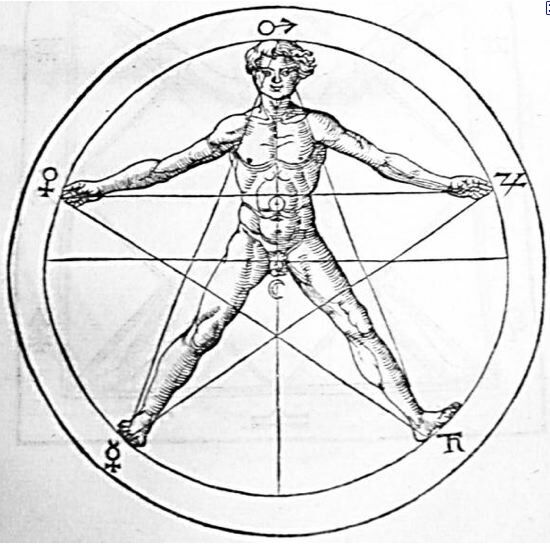 Compare this with the occult number philosophy of Agrippa based on the pentacle below. When one manages to decode the occult numerology of the Statement one can see that the goal of the Working Group is to have every overweight junk-food addict in Canada, the typical “high-risk” patient, on some combination of pills for “high” blood pressure and “high” cholesterol. The “targets” for blood pressure and cholesterol are set low and arbitrarily to guarantee that most of the Canadian population would be on some drug. The drug dealers can be assured that doctors will prescribe the newest, most expensive patented drug rather than a cheaper generic alternative because they have already spend hundreds of millions of dollars in advertising the advantages of the patented drugs. This is called clever marketing but it has nothing to do with the health of the population. The consequences of self-destructive lifestyles will not be lessened by any number of drugs which will have the unintended consequence of worsening those lifestyles when people are convinced they can continue those lifestyles with impunity under the “protection” of drugs that make the numerical symptoms of those lifestyles look better. While the Position Statement gives lip service to the necessity of “health behaviour interventions” it insists also on the necessity of “vascular protective measures”, code for expensive drug prescription. Canada is currently in the middle of a federal election campaign in which the most important issue for voters is “health care”. All parties are promising to increase “health care” spending by 6% a year indefinitely. With an inflation rate of only 2%, a PhD in mathematics is not required to see that in the not too distant future “health care” will consume the entire tax revenue of federal and provincial governments. The increase in “health care” spending is driven by the sort of activities represented by this Position Statement but no candidate dares to mention drug-induced magical thinking in their campaign speeches or platforms. The electorate loves its addictions and demands infinite “health care” to provide the mirage of protection from the consequences of those addictions and any candidate who points out the obvious absurdity of this belief is dead electoral meat. A considerable part of the pharmacological recommendations to prevent cardiovascular events and fractures in healthy persons lack any solid justification. No clear efficacy, nor the size of the effect of these agents or a clear balance between risk and benefit make the intervention clinically and socially worthwhile. The “therapeutic targets” and the “operative definition” of disease or risk factor that include instruments or tables to calculate risk are new gateways to unnecessary medicalization. 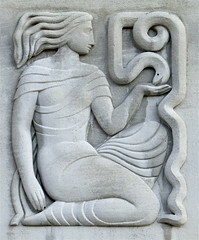 In the context of modern medicine, immersed in conflicts of interest, the physician is obliged to interpret the results of trials and the recommendations from guidelines and consensus at a critical distance, and to place emphasis on the development of clinical prudence as a desired skill. In other words a truly professional doctor will ignore any advice from the drug dealer funded covens and use his or her own best judgement. Here is a graphic illustration of the concept of moral hazard as applied to the drug treatment of lifestyle diseases. Many studies confirm that doctors’ behaviour can be influenced by drug advertising, but many of them are unaware of this. Not only the advertising text, but also the images play an important part. For example, see the above image in the Lescol advertisement published in the April 2008 issue of Rivista SIMG (Journal of the Italian Society of General Practitioners). Lescol (fluvastatin sodium) is one of the statin class of drugs used to treat of high cholesterol when diet and other lifestyle changes don’t work. The Summary of Product Characteristics states “for best results in lowering cholesterol, it is important that you closely follow the diet suggested by your doctor”. What kind of advice could the doctor have given the two people on the beach? They seem to be really happy and relaxed. The pastel colours, the calm sea and the blue sky in the background convey the impression that all is going well and no changes are needed. The designer must have been influenced by the Colombian painter Fernando Botero, famous for his fat men and women, who generally emanate a sense of calmness and satisfaction. 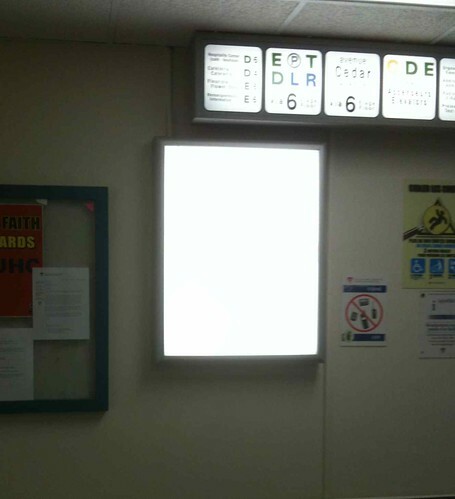 What I can understand, as a doctor, after looking at this image? 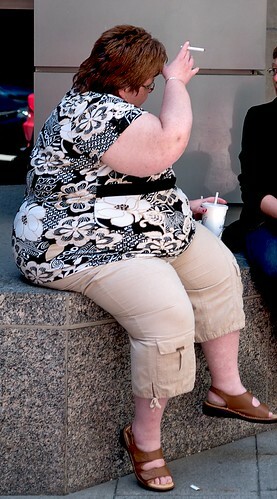 “It doesn’t matter what I advise my patients to eat; it isn’t worth them trying to change their lifestyle behaviours. No professional should take any benefits from any industry for which s/he makes recommendations to clients. Medical licensing bodies should de-license any doctor who does so. Here is a classic example of Big Pharma controlling what doctors get to hear during “continuing medical education”. Big Pharma pays big money to have their logos appear below that of McGill, a presumed institute of higher learning that is tacitly approving of their drugs and the methods they use to promote them. There is always the meaningless disclaimer about how the grants are “unrestricted”. Just try inviting a speaker who is at all critical of Big Pharma and see how fast the grant disappears. How much does the McGill Faculty of Medicine receive? How much of the money goes into undergraduate education? Is the money also influencing what gets taught to medical students? Write to the Dean of the Faculty of Medicine, Richard Levin, and try to get his answers. Lots of luck. Why am I not surprised? 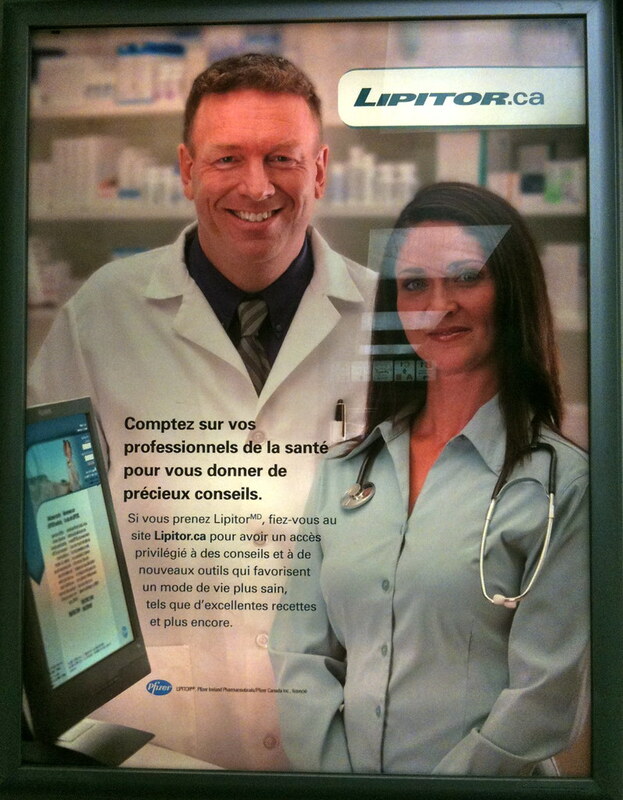 In Quebec, doctors are paid by drug dealers to prescribe drugs. “Dr. LeLorier reports having served as a paid speaker or consultant for the following manufacturers of statins: Merck Frosst Canada, Pfizer Canada, AstraZeneca, and Bristol-Myers Squibb.” Why would anyone take any advice on statins from him?